Marginally funny mockumentary series about the planning committee for the London Olympics loses something in translation. This irreverent British mockumentary series about the inner workings of the London Olympics planning committee takes a fantastic premise and grinds it down to a yawn-inducing final product, then somehow stretches it out over two seasons. The overblown pomp and circumstance of Olympic Games are certainly fertile ground for comedy, especially when those Games are being held in the motherland of pomp and circumstance, and yet the series somehow manages to mostly miss the extremely large target. Some of that is due to comedy that just doesn't translate, such as apparently comical discussions about celebrities like Sebastian Coe who are mostly unknown outside of the UK, but it's largely just that the series isn't written very well. Hugh Bonneville leads the cast and the Olympic Deliverance Committee as Ian Fletcher, a bumbling but poised and stuffy bureaucrat who valiantly attempts to put a management spin on the inept failures of his staff. Those failures include boondoggles such as an Olympic clock set to start counting down to the Games two years in advance but erroneously designed by its idiotic commissioned artist to end up at the date on which it started rather than the opening ceremony date. As another example, Fletcher and his team lead touring dignitaries from the Brazil 2016 planning committee on an ill-fated bus tour to the Olympic facilities that finds them lost and stuck in traffic for most of the day. The situations are played out as just enough over the top that they come off as completely ridiculous rather than as potentially believable, delivering far more likelihood of groans than chuckles. Surely the writers could have tried harder to have a field day with the actual idiocy of Olympic planning rather than veering into the realm of poorly contrived situations frequented by the likes of the later seasons of The Office (US). Fletcher is somewhat assisted by his head of marketing, Siobhan Sharpe (Jessica Hynes, a long way from Spaced). She's adept at marketing double-speak that carries no actual meaning, but not so effective at delivering tangible results. Fletcher is also burdened with a loopy head of transportation named Graham who manages to make traffic conditions much worse rather than better thanks to a flawed traffic light phasing program. There's also a Head of Contracts, and a Head of Sustainability, which nobody seems to understand. Other peripheral office characters make recurring appearances but little impact. On the upside, the entire series is narrated by ex-Doctor Who David Tennant, carefully explaining even the most obvious of the team's many failings, adding faux documentary gravitas to the onscreen shenanigans. 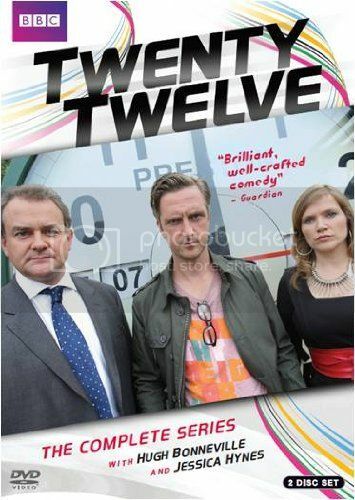 The DVD set includes all 13 episodes, which represents the entire two seasons of the show. Bonus features include cast and crew interviews. The nature of the series demands that it should have been released to US DVD no later than last summer, when it might have actually made some impact in spite of its meager contents. As it stands now with its tardy Twenty Thirteen release, it's little more than a footnote to Games we've mostly already forgotten. There are a few laughs to be found here and there, but not enough to forgive its late arrival.